Careful, Jazz Players. 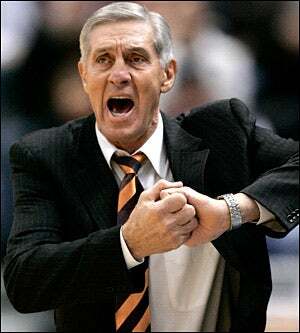 Jerry Sloan Is Monitoring Your Facebook Status Updates. Grumpy old man Jerry Sloan and the Jazz brass are reportedly unhappy with little-used backup Kyrylo Fesenko, which isn't terribly surprising given that Jerry Sloan hasn't been happy since the Eisenhower Administration. What's surprising is the reason: Facebook status updates. Fesenko, whose team option is up this offseason, recently had an exit interview with Sloan and general manager Kevin O'Connor. It didn't go so well, reports The Salt Lake Tribune. He apparently was asked by general manager Kevin O'Connor and Jerry Sloan to explain some of the updates on his Facebook page. There are those more Facebook savvy than myself, but one of the posts in question concerned being happy to be in Los Angeles during the playoffs because it was such a good city in which to go out. For the record, Fesenko didn't play a single minute of the Lakers series. Earlier this season, you might recall, Sloan was thoroughly discombobulated by the concept of social networking. "I don't even have a computer," he said at the time, when asked about Twitter. "I don't know how to turn one on. I don't know what you're talking about." He does now, evidently. And wouldn't it be just like Sloan to teach himself personal computing merely so he can monitor whether his players are showing sufficient grit and moxie?